The United States is a great big country, and a whole bunch of it is filled with great big houses. They’re called McMansions, and since 2016, the foremost chronicler of those houses has been the blog McMansion Hell. 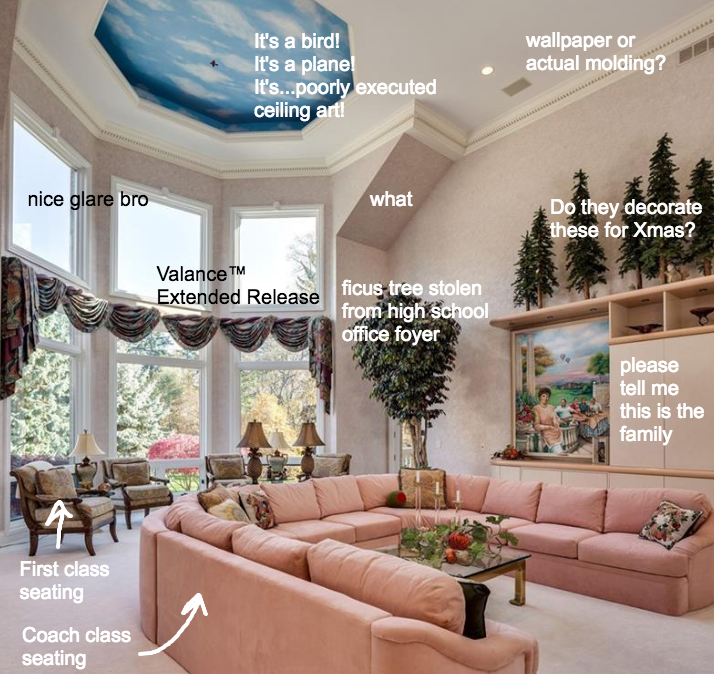 McMansion Hell grew in popularity in recent months by mixing sarcasm, internet lingo, and erudition in commentary superimposed on real estate listing photos. It has a whole section of homes that are “Certified Dank™” — the best of the absolute worst. The blog has been featured in a variety of publications including Business Insider, The Independent, and the Huffington Post. But on Monday, Zillow, the biggest and most influential real estate website on the internet, sent Wagner a cease and desist order, leaving the future of her site as imperiled as the value of a 5,000 square foot home outside Las Vegas in 2008. It concluded with a demand that she immediately stop using images from Zillow and delete all that she had obtained from the site. The cease and desist letter was not a response to the type of content or commentary that Wagner was offering, she said. Zillow sent the letter the same day the Washington Post published a story on the return of McMansions in which Wagner offered commentary as an expert on the topic. By Monday afternoon, McMansion Hell had been taken down. She later tweeted that the “url is down temporarily do not be alarmed,” and said she was seeking legal counsel. Fans were dismayed by the disappearance of the site, which in addition to epic McMansion take downs also included lengthy posts about architectural history, theory, and terminology. The blog broke down difficult topics like postmodernism, modernity, and all the little bits and pieces of buildings that McMansions so catastrophically fail to get right. Many people also pointed to the concept of “fair use,” which under certain circumstances lets content creators use other people’s work for things like criticism, parody, or satire. Zillow's letter mentions fair use, but argues it doesn't apply to McMansion Hell. When asked about the concept, Heffter pointed to the agreements Zillow has with the providers of its photos, but did not elaborate on why the company believes Wagner's blog would not qualify as fair use. The letter also claims McMansion Hell might be violating the Computer Fraud and Abuse Act (CFAA). However, legal experts who spoke with BuzzFeed News were not impressed with Zillow’s arguments. “That's probably why they made it only in passing,” he added in an email. “It would be a very hard case to win in court,” Becker added, referring to Zillow's argument.